Laurie Sadowski is a certified personal trainer and nutrition and wellness specialist, food writer, and musicologist. She spends her time spreading awareness about balanced living, cooking, and baking, and continuing her research in modern music and art. Caryn Hartglass: Hello, I’m Caryn Hartglass and you’re listening to It’s All About Food. Hello, good day; it’s November 30th. It’s the last day of the World Vegan Month. I can’t believe it’s going to be over, but that doesn’t mean that after November we can’t continue on the path to celebrate plant foods. And why we love them so much. Not only are they delicious, but they’re gentler on the planet then the production of animals for food, and they’re also a lot nicer all around. Now, I talk about a lot of things on this show – of course, it’s always related to food, my favorite subject – we talk about the destruction of the environment, we talk about the horribly cruel animal agriculture…But for the next three weeks, it’s party time here, it’s celebration, and we’re only talking about healthy, delicious foods. Because it’s time for the holidays, I want to give you lots of options and lots of ideas. There’s something for everyone. So we’re going to start with a topic that’s becoming more and more prevalent. It has to do with allergies. 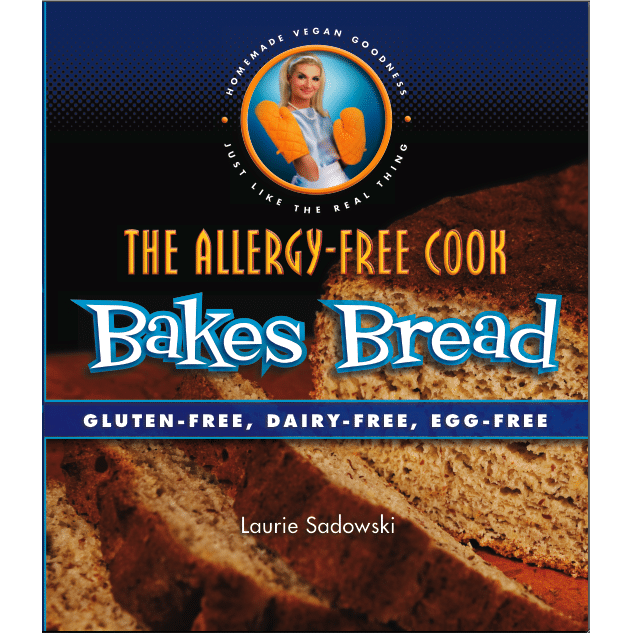 So we’re going to talk with Laurie Sadowski; she has a new book out called The Allergy-Free Cook Bakes Bread. She’s a certified personal trainer and nutrition wellness specialist, food writer, and musicologist. She spends her time spreading awareness about balanced living, cooking, and baking, and continuing her research in modern music and art. Welcome to It’s All About Food, Laurie. Laurie Sadowski: Thank you. Thanks for having me. Laurie Sadowski: Yes, I definitely agree with that. I’m very creative when it comes to it. Caryn Hartglass: It’s a good thing, because people appreciate delicious beautiful food; there’s no question about it. Sometimes, we have to get really creative, especially when we’re starting to eliminate things. Laurie Sadowski: That’s exactly what I was thinking. When you’re diagnosed with Celiac or any food allergy, and then you add being a vegan or a vegetarian to the mix, you really have to think outside the box to eat what you want. Caryn Hartglass: But the good news is, you can do it. Laurie Sadowski: Yes, that’s very true. Caryn Hartglass: I’ve been doing a lot of gluten-free baking and vegan baking, and I’m having a great time with it. I don’t necessarily have to do it, but I’m really enjoying and discovering – I’ve said this before, but when I eliminate foods, I find that all of a sudden, the door opens. I have more variety than ever. Laurie Sadowski: That’s definitely something very true, and I write that in my book. Often, when we don’t have restrictions, we think, what do we use – butter, eggs? – and everyone asks me all the time, “Please, how do you bake without eggs,” or “How do you bake without butter or flour? But there’s actually about 23 gluten-free flours that are common, that’s not even the ones that aren’t, and then there’s so many options to switch out the eggs or the milk or the butter and stuff like that. Caryn Hartglass: Okay, let’s back up a little bit. Can you share a little history about how you discovered you have Celiac disease? Laurie Sadowski: Okay, sure. Like most people, I didn’t ever feel quite well.. I had a lot of gastrointestinal problems growing up. Things just didn’t seem right, but to me, I thought it was normal. I thought it was just how you were supposed to feel. When I went away to university, I just started feeling sicker and sicker, and I suddenly started loosing rapid amounts of weight. I lost 60 pounds in just a few months; I was getting a lot of neurological problems. I didn’t know whether to chalk it up to university – maybe just not taking care of myself as much as when I was younger – but then it just started getting frightening, as I was loosing the weight, and having up to 20 bowel movements a day. I ended up being diagnosed with Celiac. Caryn Hartglass: You know, it’s important to talk about it for a lot of different reasons, but not everyone experiences the same symptoms, so it’s a little more challenging for the doctor to know, or for you to know, what you have. Laurie Sadowski: It’s definitely difficult. Caryn Hartglass: And it affects different people differently – where all of a sudden, people are devastated with this problem, and for some others, it gets progressively worse over time. Some people are diagnosed as a child, but other people can be perfectly fine, and then as an adult all these problems start happening. It’s really important to talk about it. What surprises me, mostly because the symptoms vary, is doctors are still misdiagnosing it and are not testing people right away for Celiac disease. Laurie Sadowski: It’s become so much more common. We hear about it a lot more, and we see more products on the shelves. But doctors are still saying things about how it’s all in your head or how it’s just stress, it’s IBS – and that’s the blanket term for “we don’t know what’s wrong with you, so let’s just see if it goes away.” And it’s too bad, because people don’t feel well. It could, for some people, be stress, because stress can affect your gastrointestinal systems. However, for people who are going through debilitating symptoms, it’s probably not stress. Caryn Hartglass: I don’t know, I’m not a medical doctor, but I would imagine it’s pretty challenging today with our crazy health care programs and insurance, and it’s probably pretty stressful there. I’m thinking that kids in public school should be tested every year for Celiac disease, just to know. There were three articles in the New York Times recently about Celiac disease, and one just came out like five days ago. It just – number one, I’m surprised that doctors don’t catch it right away. But some people tend to be a little glib about it. Micheal Pollan recently wrote an article in the New York Times, and he said he was dubious about all these gluten allergies – but there’s nothing dubious about it; it’s a serious disease, and a lot of people have it. Laurie Sadowski: I think the issues is that a lot of people, like celebrities, go “gluten-free” and they talk about it like a diet. It’s almost difficult for Celiacs to hear. We need to be taken seriously when we go to places. I don’t eat at restaurants, honestly, I’m scared to. I was very sick at some point, but some people do eat at restaurants liberally, and they might say, “I’m Celiac and one crouton in my salad might make me very sick; cross-contamination is a big deal,” but then there’s a stigma going around that it’s a diet and a fad. I think that him being dubious shouldn’t be the amount of diagnoses there are, but instead, the amount of people who say they need to eat gluten-free, or want to. And maybe they do feel better and that’s fine; there’s nothing wrong with eliminating it from your diet if you don’t feel well when you eat it, but being laid-back about it can cause a concern, just like with any food allergy. Caryn Hartglass: One thing that I recently read that I was surprised about, because I didn’t know – even a healthy intestine doesn’t completely break gluten down. So those of us who don’t have Celiac, or any other kind of wheat intolerance, still can’t break it down. And I think there’s a clue there that there are shades of gray. Putting Celiac aside, I think a lot of people have issues, because we don’t digest gluten. Laurie Sadowski: There was an article written last year in a medical journal, and they discovered that there is such thing as gluten intolerance. It doesn’t have the same response in the body as Celiac does, but it did show that there’s actual intolerance to gluten that people have that isn’t Celiac. I think that’s a huge red flag, because I’m also not a doctor, but there’s also proofs that a gluten and casein-free diet may help children with autism – and that may work for half the kids, and it may not work for the other half, but for the half that does work, it’s significant. Caryn Hartglass: I know, why not? Laurie Sadowski: I mean, there’s nothing to loose, other than the possibility of not eating gluten again, which doesn’t have to be that big of a deal. Caryn Hartglass: So people talk about how difficult eating can be – one, if you’re a vegan, two, if you’re gluten free – but personally, as a vegan, I don’t find it difficult at all. I started on this path decades ago, and it’s so easy now because the word is in our vocabulary, they talk about it on TV shows, they make fun of us, they embrace us – there’s all these great products out. Celiac, too, there are issues in restaurants, because it’s hard to trust. But there are certainly more products and more knowledge coming out about it. Laurie Sadowski: Certainly for me, in five years or six years, I can’t even believe – there was nothing on the shelf when I was diagnosed. And I’m in Canada, so things are a lot slower here. And I can’t believe that there’s sections and aisles dedicated to gluten-free. It blows my mind. Caryn Hartglass: So let’s talk about the fun part. There’s a lot of great things that you can make that don’t require wheat. That’s where the challenge is, obviously. Do you have any favorite flours you like to work with? Laurie Sadowski: Yeah, definitely! I love Sorghum flour; I use it as a sort of base flour and then build, using other flours on top of that. Sorghum flour is pretty high in protein, it’s pretty high in fiber, and it’s more of a whole grain. If I could eat wheat, I would never use regular, white all-purpose flour; it lacks all the nutrition. When I bake gluten-free, I don’t want to use something like white rice flour that lacks nutrition, so I was trying to seek something that still delivers a nice flavor without tasting whole grain or hearty, but that gives you that nutrition too. It’s the perfect balance; I love Sorghum flour. Caryn Hartglass: Do you make it all with Sorghum in it, or do you add other things to it? Laurie Sadowski: Depending on the recipe, I add other flours. Gluten-free baking works best with a mix of flours, and sometimes starches. So, in addition to Sorghum, I sort of mix a match of other ones – I like quinoa flour, because it’s very high in protein and it binds things together very well because of its protein content. It’s also very good for you. We hear it all the time now, how nutritious quinoa is. Teff is another one, an ancient Ethiopian grain that is also very high in protein and delivers a very earthy flavor, so it’s nice for loaves of bread and anything you want to give that sort of comforting, earthy, hearty taste. Rustic. That’s the word I’m looking for. I like millet flour for anything like cupcakes or cinnamon rolls that are really a little bit lighter, where you want that tenderness to it; millet flour is really nice for that. And those are whole grain, which is why I like to use them. Caryn Hartglass: They don’t use forks or knives, and they use this pancake to scoop up everything. It has a nice, foamy texture and a great flavor. Laurie Sadowski: It’s fermented for a few days. Obviously, our tough grain we get here isn’t what they have in Ethiopia. Unfortunately, a lot of restaurant who use it mix it with wheat flour on the side, so it’s not gluten-free. Caryn Hartglass: A lot of times when you have specific food needs and you have family and friends who care about you, they want to prepare something that meets your needs. As a vegan, it’s okay – sometimes they say, “I put a little butter in it” and they don’t realize that even a little is not acceptable. But when it comes to being completely gluten-free, how do you handle that? If you’re going to an event, do people ask if they can make you something? Or do you just bring your own food? Laurie Sadowski: I usually just bring my own, because it’s easier. It’s easier for me, it’s easier for them. Everyone always asks, and I’m appreciative, but really, I don’t mind packing a dinner. Then they don’t have to fret I don’t have to worry – I guess I’ve never been in a situation where it was a huge concern. Even for a wedding, I once packed a dinner, and it wasn’t a big deal. When I eat with my parents, I usually just make us dinner. If it’s an event like Christmas or something like that, I just bring some stuff. Or we talk about it before and we see what can be done – but usually, I just bring it to make things easier. Caryn Hartglass: There are more places that are gluten-free or have certifications, especially by people who have Celiac disease, so you can have a little more trust in what’s going on. I don’t know about Canada, but I know in New York we have places. Laurie Sadowski: I mean, New York would be a dream. I’m sure that if I went to New York, I would eat my way through it. I”m not too far out of Toronto, and Toronto is quite successful for me, and even though I’m quite the distance from Ottawa, Ottawa is quite good too. I live in a smaller area, but I also live quite close to the border, so if I do need groceries or anything, I can always hop over and see how much more you guys have. But there is definitely things here that are easy to get. And some vegan restaurant, especially raw vegan restaurant, are usually gluten-free, so I’m confident with eating at those. There are a handful of others too. Laurie Sadowski: And lauriesadowski.com just goes right there. Caryn Hartglass: Okay. And you have some tips about traveling through Walt Disney World. How is it traveling? Laurie Sadowski: You know, I don’t travel too much, and usually if I do, it’s been in my car, so I’ll pack a cooler and know which grocery stores are good. I stay in a hotel and try to get one with a kitchen or minimally a refrigerator. Disney was literally, I mean, amazing. Anyone who wants to eat well, just go to Disney. You’ll eat better than you ever have there. Their food allergy protocol is intense. I’ve never had a problem, just because I’ve always organized it beforehand. I’ve never done anything where I’ve traveled to Europe or anything, since I’ve been diagnosed where I would have to release through a lot of details, as opposed to somewhere drivable, or where I can just access a grocery store easily. But beforehand, I always scope out restaurants in the area – “gluten-free Cleveland” or “vegan Cleveland” and then I mix and match, I make a lot of phone calls. It just require a lot of planning. Caryn Hartglass: You do have to do some planning, but I want to say, fortunately, because it is becoming so popular, they’re certainly everywhere. There’s more and more places that will be gluten-free friendly. Caryn Hartglass: Let’s talk about that. That seems to be extra-challenging for some. They tend to say we’re vegan, but kind of allow some eggs and dairy into their lives just because it’s so challenging. Laurie Sadowski: I definitely think that, just like with anything, you have to plan a little. And I think you have to like to cook. You can get away with some things off the shelves, but for the most part, they’re not super nutritious. I mean, you can eat some of the proteins, because you can’t eat anything with gluten in it. You would definitely need to experiment with it. But as long as you were eating a wide variety of foods – if you think, “What can I eat? – rice, peanut butter, apple juice?” – that’s not going to be nutritious for you. That’s not going to be nutritious for everyone. But if you think of all the different grains – quinoa and teff and millet and buckwheat, as well as rice and wild rice, and then you can maybe back a little, to be able to have some sandwiches and treats when you want them…and then you can focus on other things, like legumes and nuts and seeds and things that you should be eating as a vegan, so you’re getting all your amino acids and all your healthy fats so you can easily round it out. But it does require a bit of thinking outside the box, and being open to new flavors and new tastes. Chances are, you’ll probably try something that you haven’t had before. Caryn Hartglass: Well, I’m not going to say that it would be a good thing if everyone had Celiac disease, but t there are positive things to it. I’m always telling people to get back into the kitchen, and sometimes it takes something very serious to get people back into the kitchen. Many people have different debilitating diseases, chronic diseases, and they find that they can’t eat properly in restaurants or with prepared food – but then they learn how to cook, they learn what they need to do, and it all requires getting back into the kitchen and learning about whole foods. It really is simple, once you get to it. I think that anything that gets people back into the kitchen is a good thing. Laurie Sadowski: And I totally agree. I didn’t really cook much before I was diagnosed because I was in my 20s and a university student and I made a lot of canned soups, and just basic sandwiches. I baked chocolate chip cookies; that was pretty much all I baked. And I realized that if I’m going to do this, I have to start learning how to cook, because I don’t ever want to miss out on one food that I liked before. Certain things are a little more frustrating than others, because things that are vegan that would be convenient aren’t gluten-free, and vice verse. But in general, I don’t really miss anything, I just have to try to recreate it instead. Caryn Hartglass: I’m looking on your website and there’s a recipe index. Is this all the recipes that are in your book? Laurie Sadowski: There’s recipe index on the website that’s just like my blog recipe index, but then there’s an area on my website called the Allergy-Free Cook Bakes Bread, so if you click on that, there’s a table of contents, and you can see all the different recipes that are in the first book. This is the first in a series; the next is called Allergy-Free Cook Bakes Cakes and Cookies. So this one is all the breads and the muffins, cinnamon rolls, pizza, pizza crusts, stuff like that. And that’s all under the Allergy-Free Cook Bakes Bread area of the book. Caryn Hartglass: This is serious, because there’s so many things that need to be in each book, you needed to make more than one book. Laurie Sadowski: My plan was having a huge book with everything, but then I thought, let’s get the breads down pat here. Let’s get the things that people miss most. If you get diagnosed with Celiac, most breads at the supermarket are either not very tasty or are void of any nutrition – lots of white rice flour or potato starch – or they’re not vegan. The few that are good have eggs in them, and even there’s a bakery, a gluten-free bakery in Toronto, so I called and asked if their bread had eggs, because I would be int Toronto for the day and thought I could get a sandwich. I asked if they were vegan and he said, “Oh, come on. They can’t be made without eggs.” I was just like wait a second – but I just said okay, thank you, and I hung up. But they can! Caryn Hartglass: They can, and I make some here myself. Once you know how to do it, it’s not complicated. Do you have any plan on having a vegan-gluten-free bakery? Laurie Sadowski: I’ve definitely thought about it a lot. I really enjoy what I’m doing, and I really enjoy making the recipes and I wouldn’t even mind if I was in bakery part-time, but I think if I did it all the time, I don’t know if I would have the time to experiment and build new ideas, because I would always be supplying my bakery. I’m not sure that I would want it as a full-time thing, because I enjoy it so much right now. I just really like how it’s panning out. Caryn Hartglass: You know, it’s hard word having a restaurant or having a food business, so you have to really, really want to do it. But there’s no question that the need is out there. Caryn Hartglass: I think that breads are probably the hardest. So the next book you’re coming out with is cookies and cakes. That’s a little easier, isn’t it? Laurie Sadowski: I thought it would be. But then when I realized that I wanted – obviously, I come up with the vast majority of recipes with myself; I just experiment and come up with new tastes and ideas – but there’s certain staples you need in your repertoire, like a chocolate cake and a yellow cake and stuff like that. To perfect some of those, both vegan and gluten-free and whole grain and no refined sugars was so important to me that I would never settle if it was just good, or even if it was great. I wanted it to taste excellent. A lot of people around me were inundated with “How good is it? Do you like it? Do you think it tastes regular? Do you think it tastes normal?” Because I want to make sure that it was what we remembered and it wasn’t just something that seemed like a bit of a knockoff. Caryn Hartglass: When you say no refined sugars, what are you using? Laurie Sadowski: I use, well, it depends on the recipe, but I primarily used unrefined cane sugar, evaporated cane juice, something like that? Laurie Sadowski: But I also use agave nectar and maple syrup, I love maple syrup. So I’d say those are the primary ones that I use. And molasses. So just are a mix and match of those The only other one that I use which is sometimes refined is icing sugar, which is confectioner’s sugar, but we call it icing sugar here, which I just use for decoration. So the rest of the stuff is all unrefined, and even though calorie for calorie, it’s all pretty much the same as regular sugar, and sugar is sugar is sugar, at least you’re getting some of the nutrients. Caryn Hartglass: Sure. Well, I think it’s ambitious, and I know it can be done, and I look forward to seeing that book as well. So Laurie, thank you for everything you’ve done, for this book and the great recipes – I know that many, many people are going to benefit from this work. Caryn Hartglass: And I look forward to the next one. Your website, again, is lauriesadowski.com, the book is Allergy-Free Cook Bakes Bread – and there we go. Thank you so much for joining me on It’s All About Food. Laurie Sadowski: Thank you so much for having me! I appreciate it. Caryn Hartglass: Okay, have a great day! Laurie Sadowski: Have a great day. Caryn Hartglass: Okay, we’re going to take a very short break, and then we will be right back to talk more about delicious food! I’m Caryn Hartglass; stay with us.